Upcoming:August 25-27, 2017: Weekend workshop at Kripalu Center, Stockbridge, MA. To register, call Kripalu: 800-741-7353. Upcoming:January 5-7, 2018: Weekend workshop at 1440 Multiversity, Scotts Valley, CA. Come experience Christine's life-changing Navigating Change workshop in this expansive, beautiful new program center near Santa Cruz, CA. 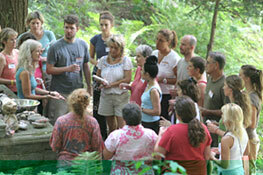 To register, call 1440 Multiversity: 844-544-1440. NAVIGATING CHANGE ~ Available Now! I'm thrilled to announce the forthcoming publication of my new book, NAVIGATING CHANGE. It contains all of the teachings, inspiration, practices and step-by-step guidance that have made my long-running national workshop a life-changing experience for thousands of people. More coming soon! Click here for overview and ordering information. Often described as life-transforming, Navigating Change supports you in consciously exploring the lessons learned from your past, the wisdom offered in the present moment, and the creative possibilities of your future. You'll learn about the gifts, pitfalls, and possibilities of the change process and gain valuable tools to navigate each of its phases with courage and confidence. This program guides you experientially through Christine's Four Phases of Change, with dynamic teachings, creative experiential work, tools and practices aligned to each Phase. 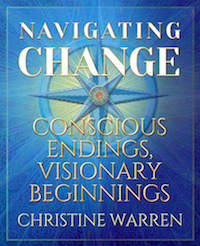 "In the aftermath of a dramatic loss and betrayal, I took Christine Warren's Navigating Change workshop. I have taken workshops in the past, but Christine has special skill in creating the perfect environment for learning and healing. Her teaching was inspiring and the climate she created was one of unity, complete support, regard, respect, love and light. Each minute of the workshop was beautifully choreographed to maximize our time and bring growth and healing. It is obvious that Christine has walked the walk. I left the workshop with hope that I would not only heal, but flourish." Completing Your Past: Integrating the wisdom and lessons of your past, experiencing the liberation of true forgiveness for yourself and others, and claiming the power of what you have learned. Living in the Mystery of the Present: Discovering the value of not-knowing as you seek your next path in life. Learning tools and approaches for resting comfortably in the space between relationships/jobs/selves, while finding clarity for your next steps forward. Creating an Inspired Vision: Using guided visualization and inner attunement, you'll identify your core life values and craft your vision for the next phase of your life, addressing both inner ways of Being and outer expressions. Manifesting Your Vision: working with the inspiring teachings of Quantum Physics and metaphysics, you'll learn to access your Higher Self, focus your clear intention, and gain deeper trust in the divine plan for your life. A Vision Quest in nature, weather allowing, provides deep experiences, sacred circle and rituals initiating new beginnings for your life. 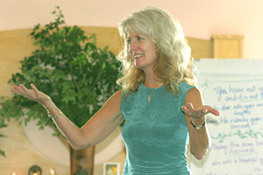 "I am so grateful for the Navigating Change workshop at Kripalu that you gave all of us. It amazes me how seemingly effortlessly you can take a group of hesitant, wounded, intelligent, powerful adults to a place within us that allows such deep inquiry and change. Your openness, your knowing, your kindness and love are so powerful. I am in awe of your gift and in appreciation for your sharing it with me and my fellow travelers. This wonderful weekend with you will be a part of me for a long time."